Film4 Summer Screen at Somerset House returns for two weeks in August, with a carefully-curated and distinctive selection of classic films, contemporary hits, cult favourites and red-carpet premieres, presented under the night sky. This year, all films in the festival line-up take on the theme of dreams, focussing on fantasies, reveries, nightmares and nocturnes. Filmmakers have long explored the language of dreams and this year’s selection will showcase the greatest cinema of the subconscious, allowing audiences to experience a sense of escapism both on screen and inside Somerset House itself. Amongst the first films to be announced for the 2018 season are two fantasy favourites. Director Christopher Nolan’s INCEPTION is one of cinema’s most eloquent and exciting expressions of the dream state – a heist film told in a unique style with Leonardo DiCaprio, Marion Cotillard, Joseph Gordon-Levitt and Tom Hardy in the all-star cast. Also showing will be the magical LABYRINTH, which brings together the extraordinary talents of Jim Henson, George Lucas, Terry Jones and David Bowie to create a beautifully designed musical adventure with something unexpected at every turn. Having attracted much acclaim during this year’s awards season, Film4 Summer Screen will offer another chance to catch CALL ME BY YOUR NAME, in similarly scenic surroundings to those on screen. Falling in love can feel like a dream and director Luca Guadagnino’s film is the ultimate romantic reverie, a sensual story of awakening desire that changes the lives of students Elio (Timothée Chalamet) and Oliver (Armie Hammer) over the course of a long, hot Italian summer. The final film announced so far is BLUE VELVET, the controversial 1986 classic directed by David Lynch. Starring Kyle MacLachan, Isabella Rossellini, Dennis Hopper and Laura Dern, the Oscar-nominated mesmerising mystery probes beneath the picture-perfect surface of suburban America. 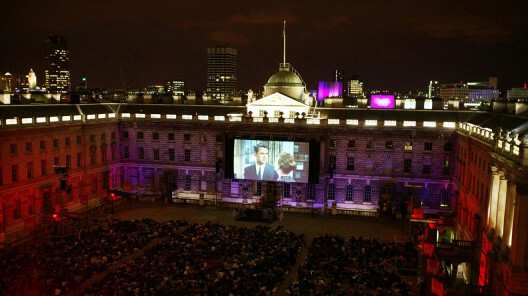 For fourteen summer evenings, more than 2,000 film lovers leave the hustle and bustle of London behind, escape to the intimate, spectacular surroundings of Somerset House (which has itself served as a set for many memorable movies) and enter into its fantastical world of films, coming together with fellow aficionados to be transported far away for a few hours. People take their spot as the sun sets over London and soak up the sounds of live DJ sets inspired by the evening’s main event, with their favourite food and drink packed up in picnics or from the surrounding stalls. They then settle in and snuggle up to see the finest films and share in the excitement and emotion. All films are shown on London’s largest state-of-the-art outdoor screen, digitally projected with full surround sound, ensuring a truly immersive and cinema-quality experience. New this year, Somerset House has commissioned a short film, exploring the dream theme, to be screened ahead of each evening’s feature film, by performance artist Mel Brimfield and filmmaker Ewan Jones Morris. Both are residents in Somerset House Studios, the experimental workspace inside Somerset House, which encourages multi-disciplinary collaboration. Somerset House provides a public platform for the work coming out of the Studios through its year-long series of events and exhibitions. Behind the Screen, a series of talks, panel discussions, screenings and special events from illustrious industry talent ahead of selected films, will also return, making Film4 Summer Screen further stand out as the film fan’s choice of open air cinema experiences. Tickets will go on sale in May, when the full festival line-up and further details about Behind the Screen will also be revealed.